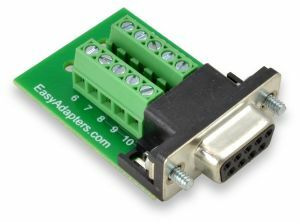 Part of the EasyAdapters line, the FDB9-TB10+ (Female) and MDB9-TB10+ (Male) are DB-9 to 10-position terminal block adapters. They provide connection points for all of the DB-9's pins and the shield ground. The FDB9-TB10+ and MDB9-TB10+ can be used for practically any application requiring a DB-9 male or female connector. We offer an optional plastic enclosure (sold separately), part number XDB9-TB-H1, for the DB9 Easy Adapters boards. This hood works for all of the Easy Adapters DB9 breakout boards. This provides additional protection for wires, insulation for conductive surfaces, and improved aesthetics. Installation is simple; simply insert the board in the lower half of the shell, tie-wrap the wires down as a strain-relief, screw in the thumb screws, and snap in the top half of the shell. Oversized, knurled thumbscrews fasten the assembly to the mating connector and are easy to operate.